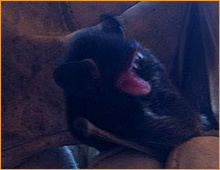 Fairfax Animal Removal and Pest Control services are provided throughout Fairfax County Virginia. We specialize in the removal and control of nuisance wild animals and pests from your home. Some of the most common animals we deal with in Fairfax are raccoons, birds, skunks, squirrels, snakes, bats, bees, wasps and rats. Animal removal and animal control in Fairfax County is closely regulated by the Virginia Department of Game and Inland Fisheries to ensure humane and proper treatment of nuisance wildlife. Before you hire any animal removal or animal control professional in Fairfax County you should check to make sure they have the proper Nuisance Wildlife Control permit issued from the Virginia Department of Game and Inland Fisheries and that they have the proper insurance and license to do any kind of work to your home. The most common types of animal problems that animal removal agents find in Fairfax County are squirrels, closely followed by raccoons, bats and rodents. Foxes and Coyotes are also a huge problem in the area. Fairfax Squirrel Removal is a very common call in the spring and fall. Squirrels take advantage of the very close housing in Fairfax and are often seen jumping from rooftop to rooftop and running back-and-forth on the power lines. This is a common action while breeding season is in effect. Squirrel Removal and Squirrel control in Fairfax is on the rise and should be handled as soon as a squirrel problem is discovered in your home or attic. The last thing you want to do is allow the squirrels to stay in your attic. Many homeowners in Fairfax Virginia area have need for squirrel removal and control however they do not know who to call. Fairfax squirrel removal should be handled in a timely fashion so the squirrels do not chew your wiring and dig holes in your sheet rock as they are in the birthing process in the attic area of your home. Squirrels are usually tree dwelling animals, nut in the areas of Fairfax, Virginia these animals are often seen running along power lines and along our Fairfax streets and byways. This nest should not be a welcome guest in your home. As soon as you become aware of a squirrel living in your attic or other area of your home you should immediately contact a professional Fairfax squirrel removal agent, we have been serving the area around the nations capital for nearly 25 years. 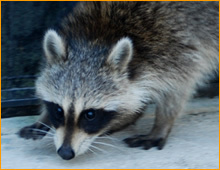 Fairfax Raccoon Removal is another common animal removal service provided by our experts Fairfax County. Raccoons are very clever animals and they have learned to adapt very well to the suburban environment of Fairfax, VA. Raccoons dig through trash, dig up yards and destroy everything to obtain food. Raccoon Removal in Fairfax is critical as the raccoons will get into the attic of your home and do a large amount of damage in a short period of time. Raccoons should not be allowed to stay in your Richmond attic and should be removed as soon as they are discovered. Raccoons can be one of the most destructive animals in VA; Raccoons are responsible for over $2 billion annually of the insurance claims throughout the United States. The distractions that raccoons do to your Fairfax area home can be astronomical. The damage that raccoons do in Fairfax area homes are as follows: raccoons tear up your ductwork, raccoons soil your insulation, raccoons cause damage to your attic vents and lastly raccoons pose a threat to your family's health by possibly bringing in diseases that are easily spread to humans. Fairfax raccoon removal is on the rise in this animal should not be allowed to spend another night in your Richmond area home. Fairfax Bat Removal and Bat Control has been on the rise for the last seven years. Bats have been found in the Fairfax County Courthouse, Fairfax County churches and many houses throughout the entire County of Fairfax. The most common problem associated with bats in your attic is the large amount of bat guano that builds up in your attic over a period of time. Bats should not be allowed to stay in your attic. As soon as the bats are discovered in your attic a bat removal and bat control professional should be called- especially an expert at Bat Exclusion. Bat Removal in Fairfax has been on the rise for the last 10 years the cases in this Fairfax of bat guano and bat guano cleanup has risen significantly over the past three years. The average cost of bat removal in Fairfax is relatively low in the initial stages however if this bat problem is allowed to remain, the cost of the removal of bats in your Fairfax attic goes up significantly. There are costs associated with the guano removal from the attic area of your home. Also there should be some degree of bio-hazard cleanup that goes along with having a bat infestation in your Fairfax, VA home. Fairfax Skunk Removal is another common animal that is found in Fairfax County and the complaints that we receive are numerous. 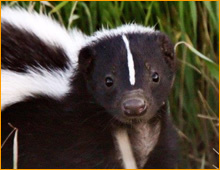 The most common complaint associated with skunks in Fairfax County is that the skunks will dig under the stoops or steps of the house to gain access to a decent place to live. This becomes a problem if a homeowner has a dog and the dog and the skunk meet. The skunk will spray the dog. The one that usually wins is the skunk. Never try to deal with a skunk removal problem yourself. Always contact a professional skunk removal expert. Skunks are a unique animal and we have found that they do some really strange things in the Fairfax, VA area. One of the more interesting things that we have found that it's specifically to Fairfax, VA is the skunks big under your front porch and has skunk babies underneath your front steps. There are several other areas in the United States that this happens but Fairfax is one of the few areas that this is a prevalent problem. Don't let the skunks of Fairfax overtake your home give the professionals listed on this page a call that today to have your skunks removed from your Fairfax home. 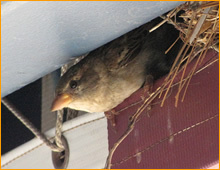 Fairfax Bird Control is a common service needed by both homeowners and businesses of Fairfax Virginia. Birds cause billions of dollars in damages annually. Most damage is caused from bird droppings. Birds, particularly pigeons and starlings commonly roost on buildings, and cause a mess with their droppings. Common services offered by our wildlife company include bird netting, bird spiking, bird fogging, and other types of bird deterrents. For homeowners they often cause a different problem, birds commonly will make their nest in vents. Typically birds in vents occur during the spring time as they are preparing a place to have their young. You may first discover you have a bird problem when you start to hear noises in the vent, and if the problem is not corrected right away the birds will have their babies and the vent will begin to take on a foul odor from the waste products of the baby birds. It is always suggested to correct an animal problem as soon as it is discovered to avoid extensive damage to your home of business. Bird control experts can solve all types of bird problems whether it is a bird in vent, or a bird roosting problem we have the solutions for bird control! These are just a few of the more common animal removal calls we deal with in Fairfax County. We also deal with other animal removal problems related to birds, groundhogs, foxes, coyotes, beavers and any wildlife that is found in the state of Virginia. We are a privately held company and do not deal with dog or cat calls. These kind of calls should be directed to the Fairfax County animal control at 703-691-2131. we also handle calls in Alexandria, Arlington Animal Removal, Vienna, Centreville, Reston and many other Northern Virginia Towns. We have had a raccoon come in thru our cat door, is there any way we can keep this from happening in the future? Yes you can, we have several options for keeping raccoons from entering the cat door. Dear Animal Control Solutions: We have a problem with a squirrel getting into the window well of our home. He disturbs me as I am trying to work. Is it possible that you can trap the squirrel? We can trap the squirrel, we have many ways to trap the squirrel, Give our office a call and let us give you a free inspection. 703-881-3170 is the number. we have had a problem with bats in our attic for the last 10 years, we are looking to sell our house because we are moving to another state, can you assist in cleaning the attic and getting rid of the bats? Yes we can, we offer complete attic restoration and can exclude the bats and give your home a warranty. I want to be anonymous with this problem. Well on Beverly Ave in McLean there has been lots of raccoons in the area for several months. Also there are several large raccoons crawling around on Beverly Ave-lower part of Beverly in back of 6610 Beverly Ave. This Lady - not mentioning who she is - well she feeds them-, and besides squirrels, deer's, opossums, and any other animals that's started to come to this area. Birds aren't a problem. There are at least 10 or more raccoons on this 1 block that comes out at night between 11:00pm to around 3:45am. The animals comes in back of her yard to feed on her bird feeders, and on her driveway as well. I live towards the top of street, and been noticing that there has been a lot of animals on that yard. There has been foxes, deer's, opossums sometimes, and once in a while coyotes walking around the area. It’s like a feeding zoo on this 1 yard lately. Next thing there will be raccoons in the houses. I have seen this happen at my grandmother’s house years ago in DC. You might want to check this out. How do I get rid of raccoons in Fairfax, VA? Getting rid of raccoons in Fairfax, VA is a complex problem that has many answers, there are several reason the answers are many, you can trap a raccoon, you can exclude a raccoon you can even try eviction fluid to get rid of the raccoon in your yard or attic. However it is possible to get rid of raccoons in Fairfax, VA.
We provide nuisance wildlife services in Fairfax zip codes 22030, 22031, 22032, 22033, 22034, 22035, 22036, 22037 and 22038. We are Fairfax, VA Wildlife Removals professionals that can solve your nuisance wildlife needs!